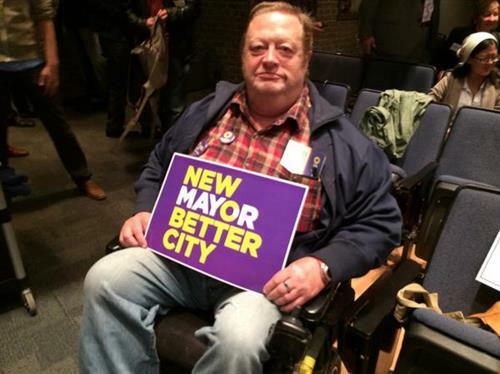 Curious how your mayoral candidates feel about LGBTQ issues? Tune in at 5:30pm as reporters Michael Lyons (@queer_mikey) and Sarah Traynor (@tweetTraynor) give you live updates on who says what at the ProudTOvote mayoral candidates debate.Have a question for one of the candidates? Let us know and stay tuned to see if we ask your question. 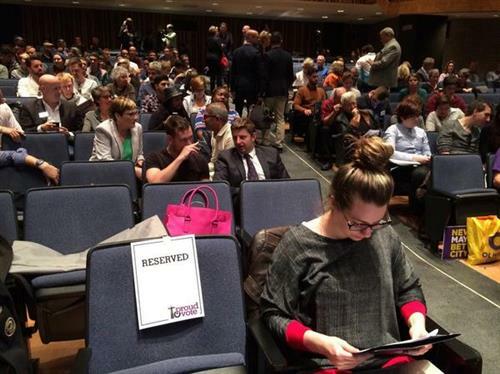 ICYMI: We're live blogging from the #proudTOvote mayoral candidates debate. Follow our live blog here:live.ryersonian.ca/Event/ProudTOv….
.@proud2vote has provided us with a cute little package of facts. Ready for it? They often face discrimination in our current support system. In July a proposal was made at city hall to help homeless LGBTQ youth. In July every member of council gave a standing ovation to two groups who helped organize Pride. Except one member of course. Can you guess? Hey, guess who is NOT at the debate tonight? You guessed it: whichever member of the Ford family running for mayor at the moment. Olivia looks very at home and relaxed here. Tory, not so much, but he's getting better.
.@johntoryTO says free speech is important, so is Pride... HOWEVER. Here's the background: Tory said he'd withdraw funding from Pride if they let @quaiaTO march in the parade. It's a hot button issue today.
.@oliviachow Change policy to make "apartheid" not able to be used w/ city funded events. Even though experts decided it wasn't hate speech? Tory says he'd do the same for any other organization. If a public funded org was spewing anti-gay material, he'd withdraw funding there. Mistakenly tagged @oliviachow in my last, deleted tweet. @johntoryTO said it's okay to change policy if we don't like an org's message. 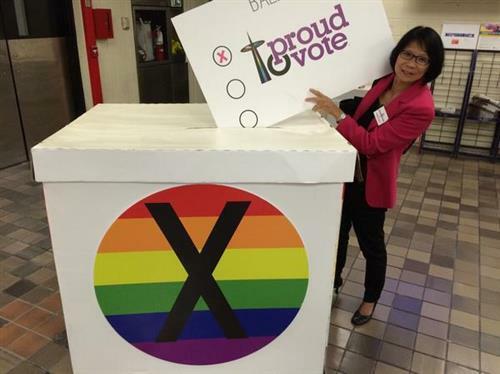 Chow says if Pride loses their funding, what message are we sending out? Even though experts decided "apartheid" wasn't hate speech, says @oliviachow .
.@queer_mikey clapped super hard when someone asked the Q. He's getting fired up. Go follow him. Tory: Hateful language can't be supported by public funding. Crowd seems split on this issue (of whether it was even hateful or not). Q: No programs for LGBTQ over 29 years old. How can you address that? Tory is asking for clarification. Apparently there is a program run by Sherbourne Health Clinic that cuts off people at age 30. Question about lack of programming for people who are 29 or over. @johntoryTO says if something receives public funding, no age cut off. Tory says if they're publicly funded they need to include everyone. Doesn't know why they're doing it. Says he doesn't know how to remedy. Chow says its sounds like their youth program. Cut offs are something 30 and not 24. Says there is need for programs for people over 30.
.@oliviachow says cut off is for youth programs, but there does need to be programming for 29 and over. What does "youth" even mean, anyway? Chow says its sounds like their youth program. Cut offs are sometimes 30 and not 24. Says there is need for programs for people over 30. Tory says there are sometimes too many orgs. Its a "patchwork quilt." Says some people fall between the cracks. Chow says local orgs need to come together to be more effective. Community needs to be connected so services aren't fragmented. Last Q: What leadership lessons have you learned from your LGBTQ friends and how will that help you build a better Toronto? Last question about leadership. What leadership lessons have you learned from LGBTQ friends and supporters? Shaping a better TO with that. Tory wasn't sure if was going to be accepted into LGBTQ community. Talks about his first time at Woody's (a gay bar in T.O). Tory: This community advocates rationally, firmly, consistently. And that LGBTQ community never gives up. There is strength in partnerships. #ToryStory : @johntoryTO walks into Woody's. Not sure if he'll be accepted. No one sure what to make of it. I'm not sure what to make of it. Chow: Community came together during AIDS crisis. This is how she learned what it means to really love. Chow: The courage to step forward and fearlessly say who you are, and who we are together. Even when it is really difficult.